I get these tubes when their on sale. I get any tube that's on sale. No slime tubes. What can I say? It's a tube. It popped pretty quick, but my tires were worn so it wouldn't be fair for me to blame it on the tube. Durable, good quality tube for commuter use. I use my bicycle primarily for suburban and city commuting, doing an average of 90 miles per week and replace about one tube every 3-4 months, due to punctures from glass, staples and other sharp objects. I do ride with patched tubes for as long as I can get away with it. Durability depends on the amount of construction and other debris in parking lots and on the roads I ride, which varies seasonally. These tubes have proven more robust than any of the others I have tried. 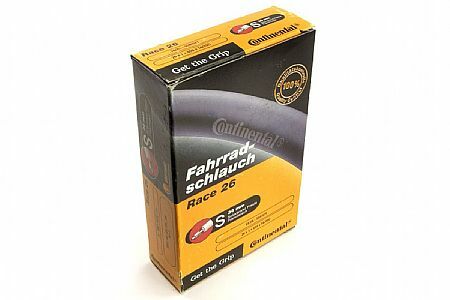 The tubes are easy to install and I have typically had good results with Conti's tubes but for some reason, had three or four flats in rapid succession with these. It may just be the time of year with lots of extra debris on the roads. I have loved their 700c tubes and don't see any reason why their 650s would be different. tubes are used on my triathlon bike. Over 1200 miles without a flat on these tubes. Great product. It's not easy to find 650 tubes anymore! These are lightweight, yet still hold up to everyday use. Very reliable and most durable under variable road conditions! Paird with the Gatorbacks and Zipp wheels my confidence grows with each outing.